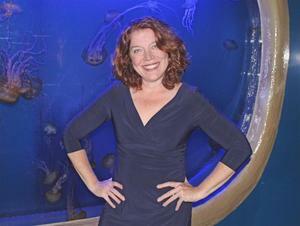 Maureen Hanley, a businesswoman with extensive professional and charitable involvement in Fairfield County, is the new president and chief executive officer of The Maritime Aquarium at Norwalk. Hanley was chosen unanimously on Nov. 7 by the Executive Committee of the Aquarium’s Board of Trustees. Her first day will be Mon., Nov. 12. The Easton resident is the eighth president – and third woman to hold the position – in the 30-year history of the popular Connecticut family attraction. She replaces Dr. Brian Davis, who left in May. Hanley comes to the Aquarium as a former community-banking executive who specialized in commercial lending. Most recently, she was a senior vice president-team leader of United Bank for the past four years. She previously had risen to vice president, head of commercial real estate, at Fairfield County Bank (1994-2006) and senior vice president and co-chair of the SNE Diversity Council for Commerce Bank/TD Bank (2006-14). Over her 24-year banking career, she negotiated billions of dollars in loans for commercial and residential projects in Fairfield and Westchester counties, and received numerous industry awards and recognition. • Life Director (2003-18), president (2013) and Woman of the Year (2016) of the Home Builders & Remodelers Association of Fairfield County. • Board member and Vice President of the Cardinal Shehan Center in Bridgeport. • former director of the Women’s Business Development Council in Stamford. • former chair of the Housatonic Community College Good Citizen Luncheon. • volunteer with the Bridgeport Rescue Mission, Special Olympics, United Way, St. Vincent’s Medical Center Swim Across the Sound, and the Human Services Council of Norwalk. • and the Stamford and Norwalk chambers of commerce, where she founded Women in Leadership councils for both. Maritime Aquarium Board Chairman Michael Widland said the Aquarium will benefit from Hanley’s extensive business experience – especially in finance, construction and change management – combined with her broad connections in the community. The Maritime Aquarium is about to embark on large changes in response to a federal project to replace the Walk railroad bridge that runs between the Aquarium’s main building and its IMAX Theater. The multi-year replacement of the bridge is expected to begin in about a year. Aquarium officials recently negotiated with state and federal officials for a “functional replacement” agreement to build a new 4-D theater (in place of the IMAX Theater, which must be razed) and to relocate and fortify elements of the Aquarium to be lost and impacted during the bridge work. Hanley has three children: Bridget, a preschool teacher in Trumbull; RJ, a junior at Worcester Polytechnic Institute; and her youngest, Kathryn. Hanley was born on Long Island, grew up in New Fairfield, CT, and graduated from the University of Connecticut. The selection process for a new president began earlier this year when Davis announced his plan to return to The Georgia Aquarium, where he had been on that institution’s original founding leadership team. The global executive-recruiting firm of Korn Ferry helped a special committee of Board members with the search. The Maritime Aquarium is a not-for-profit organization whose mission is to educate visitors about – and to create stewards for – Long Island Sound. It accomplishes this by allowing visitors to get close to some 300 species native to the Sound and its watershed, including sharks, seals, sea turtles, river otters, jellyfish and other animals. One of the top places for family fun in Connecticut, the Aquarium also features hands-on educational programs and displays, public study cruises out onto the Sound, and Connecticut's largest IMAX movie theater, with a screen that's six stories high. TripAdvisor.com reviewers rate The Maritime Aquarium as one of the Top 20 aquariums in the U.S. and No. 1 in New England.